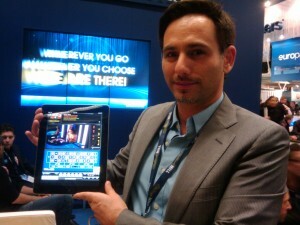 Offir Keren, William Hill’s Casino Product Marketing Manager showing off Live Casino. This week we were invited along to an internet marketing conference so decided to spend a day learning what is happening with online casinos and gambling. While we support proper casinos, we cannot ignore the growing popularity of virtual casinos. On Friday, the first main day of the London Affiliate Conference, we spoke with Offir Keren, William Hill’s Casino Product Marketing Manager. He was showing off (rightly so) their new Live Casino on for the iPad. The Live Casino for iPad, which has only been online for 2 weeks, provides clients with a very personal casino experience on a mobile platform. Rather than the usual virtual gaming room with animations and graphics, the Live Casino has a real roulette operator streamed over the web in high-definition. Bets are placed using the graphics interface in real-time. You can choose from various camera angles, so can watch the operator or watch a close up of the roulette wheel. It really is as close to playing in a real casino as you can get and it is the first live casino platform designed for a tablet. At first I was rather sceptical of what he was about to show me. I was soon won over though. Although there is no interaction with the dealer the video quality is excellent and choice of camera angles gives you some added control of how you play. William Hill are certainly very proud of what they are touting as “the world’s finest online Live Casino“. The iPad version offers roulette only at the moment, on the PC you can play Live Baccarat, Casino Holdem and Roulette UK. At the moment the iPad version is available on your browser (using HTML5) but soon will be available on Apple AppStore to download. Offir mentioned that Live Casino is already one of their most popular platforms, and at only 2 weeks in, it is set to become a major player in the online casino world. I suspect that this is just the beginning and that in future there will be online casinos with where players can interact with the dealers and other players. So, if you fancy some gaming fun and cannot get along to your local casino, then the next best thing could well be William Hill’s Live Casino. Visit their website to learn more, and play – http://vegas.williamhill.com/live-casino/.